On a bright afternoon, visual artist Kay Nau welcomed me into their studio. The space is both peaceful and energizing at once, with zines, graphic novels and ephemera framing the room, and colorful art plastering the walls. We settled for the interview in the heat of the natural sunlight pouring from the imposing window. In their childhood, Nau was attracted to manga and comics. 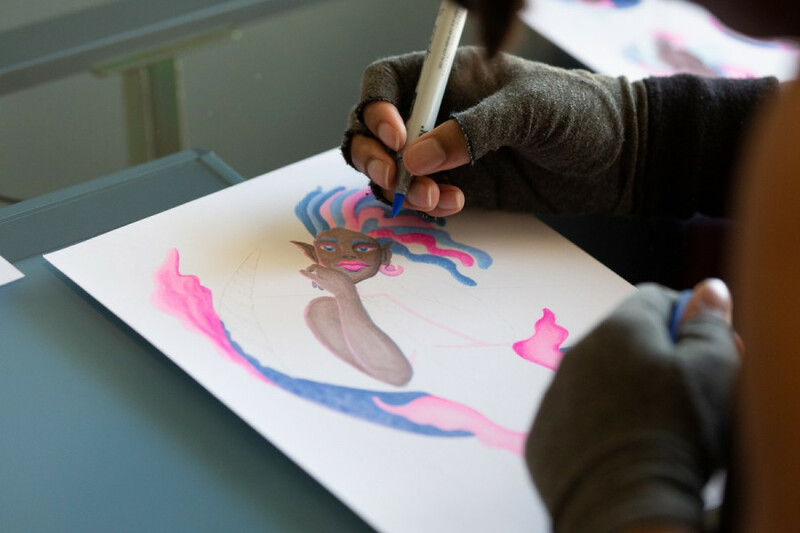 Building a foundation for their future as an artist, Nau trained and learned the intricacies of the style by mimicking Sailor Moon and Pokémon characters. Nau defines their work as comic art, but draws with proportions that make the images more realistic. Nau’s artistic career recently started to gain some speed. 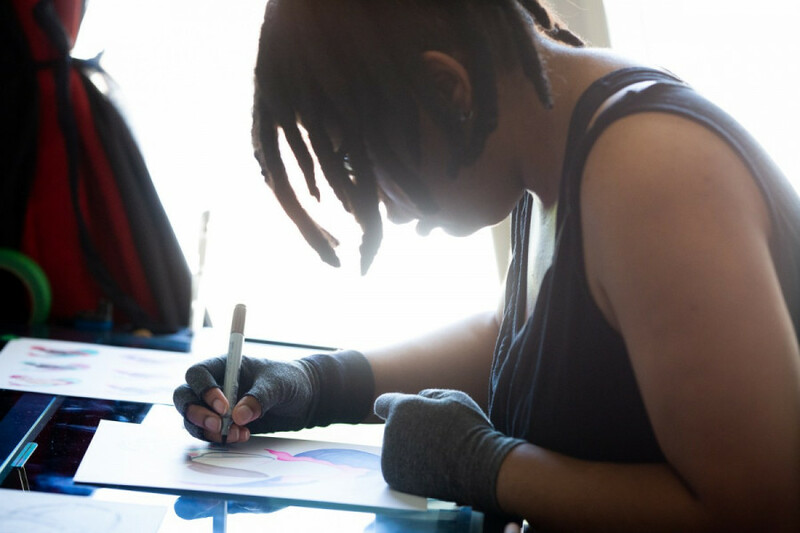 They began selling their art a year ago with success, and they were part of the Montreal Black artist-in-community residency that culminated into the month-long exhibit Symbols of Resistance last February. The residency was founded by Concordia’s Critical Feminist Activism and Research project with the intention of creating a space for Black artists to make art that is personal and that engages with the community. CFAR’s goal was to showcase art for social impact. The exhibit at a Mile-End featured artwork exploring multiple facets of the artists’ identities, and were made of varied materials, such as wood and paint. Nau explained that they draw art they wish they could have seen as a child or a teenager. Above all else, Nau values representation in art, and strives to create pieces that are meaningful. Their body of work is purposeful and relentlessly touching. Nau walked me through their Kisses series, which is composed of three illustrations of queer couples kissing. It was created for the 2017 Montreal Pride exhibit L’Amour Is Love. On a soft yellow background, Kiss 01 depicts a tender kiss shared between two men. Nau drew my attention to the man on the left of the picture, whose shirt features the design of the demisexual flag. “Most of the time Black men are shown in this very hypermasculine way, and I wanted to show that they can be really soft, too,” stated Nau. We lingered next onto Kiss 02, a much celebrated piece, which depicts the embrace of a Black woman and a woman wearing a hijab. “In LGBTQ groups, queer Muslim people are always erased, and I wanted to represent them,” explained Nau. On their computer screen, Nau zoomed into Kiss 02, revealing a lacey pattern in the hot pink background of the illustration. The details of the image bring the moment of the kiss to life; the connection between the kissers is strongly felt. After spending around 30 hours on each drawing, and often losing themselves in the work, Nau humbly created the brilliant Kisses series. “I’m in an interracial relationship and we’re not seen much-I wanted to represent that,” explained Nau. Tender, romantic, and sensual, the three drawings of interracial couples kissing pull at the heartstrings. “When people react to my art, it’s always positive,” said Nau who recently started tabling at festivals and fairs. The artist connects with their audience through shared stories and desire for social change. While they only started selling their art a year ago, Nau’s work resonates deeply with the community they are beginning to foster. Their pieces sustain a range of emotions. They make a statement, for racial, gender and sexual diversity and representation, but the pieces are also fun, luminous, and make you feel good. 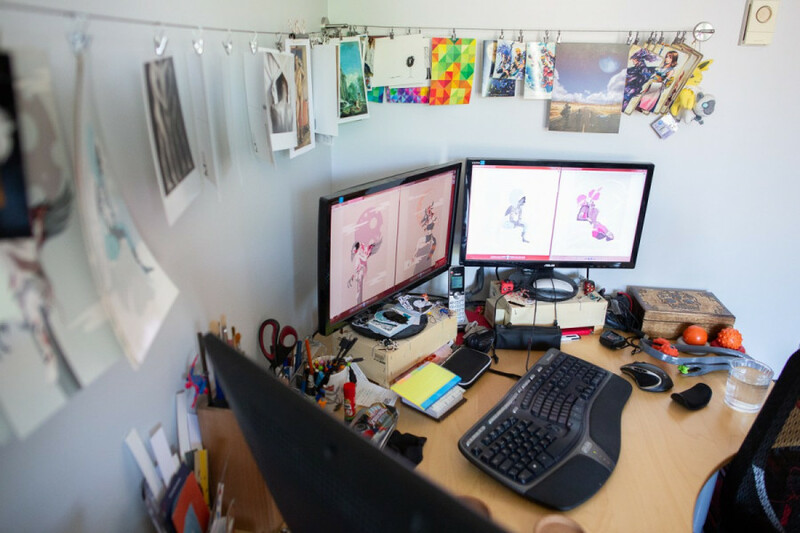 Having a background in multimedia and 3D modeling, Nau creates many of their pieces digitally, and they are currently working on an online shop to share their art to a broader public. To get a glimpse of the new pieces they are working on, visit Nau’s instagram page at https://www.instagram.com/the_creative_kay/?hl=en.